Our trust welcomed some prestigious oversees guests this month, as a delegation from Helgerson Solutions Group and New York State Partners came to Cedar Mount. We have been working with these partners over the last three years, examining how to transform our health and care systems by examining social determinants and looking at the roles different organisations play. This means looking closely at the social steps we need to take to make sure people have better health: through great pre-natal care, good early years settings and successful school careers, delivered alongside stable housing and strong employment, social and cultural opportunities. The ultimate aim is proactive prevention: colleagues from Greater Manchester have visited New York to gather best learnings and this return visit saw the US visitors come to Cedar Mount as part of their visit to Manchester to take part in the World Healthcare Congress that took place the same week. 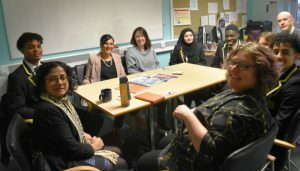 organisations in action, to observe how we are changing care models for local populations, as well as the Alliance for Learning’s involvement in the Mentally Healthy Schools Initiative – and of course the wellbeing work carried out at Cedar Mount.